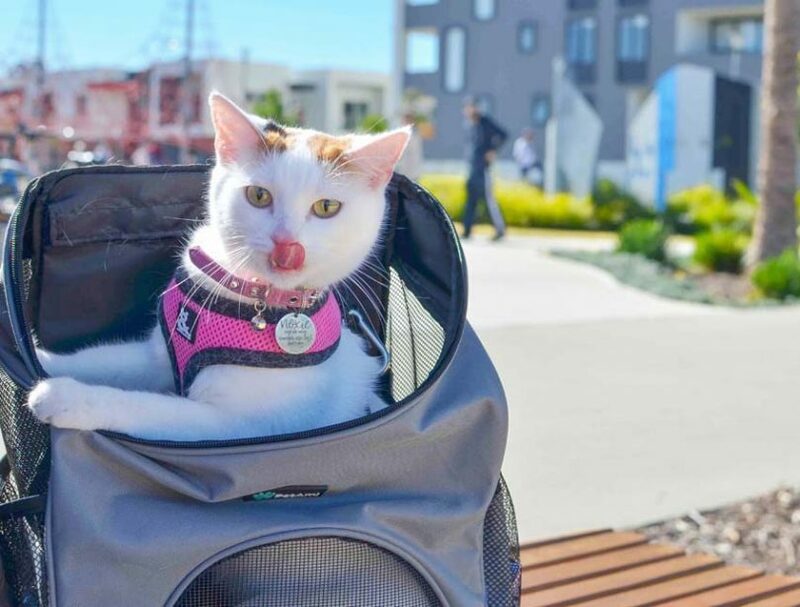 What’s more fun than one cat going places on urban adventures? Two cats! 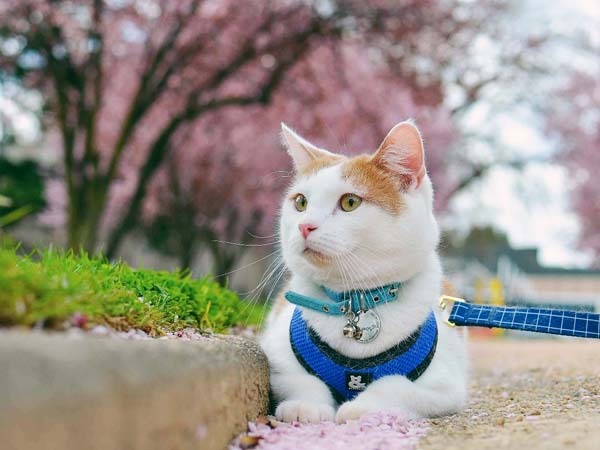 Meet a pair of cats from Australia who love adventures with their humans and adore each other. Lumos & Noxie are our 2 adventure cats and are a year and half old. 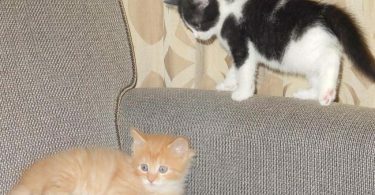 They are siblings from the same litter – but are complete opposites! Lumos is a cuddle bear, who loves people, food and being the centre of attention. At home he needs to be somewhere where he can either see Noxie or his Mummy or Daddy and will only play if someone is playing with him. Being so food motivated has really helped with training him and he has progressed a fair bit with his clicker training. While we’re out and about, Lumos can be fairly fearless. He is always the first to jump out of his backpack and go exploring. If we are in a crowd of people he will always poke his head out and say hello and ask for pats. He loves being at cafes and pubs and has been known to scale shelves to try and go play with a few toddlers (we stopped him as we didn’t know the toddlers). He also has a huge problem with FOMO, even if he is very happy with what he is doing, he has to always go and see what Noxie is doing. Noxie on the other hand is a lot quieter and shyer. We like to call her the independent wonder woman and a cheeky gymnast. She is perfectly happy to make anything into a toy and play by herself. She has some amazing gymnastic skills and can jump great heights (whereas Lumos is super clumsy!). Being a lot shyer, Noxie tends to pick her favourite people and cling to them. It takes her a lot longer to cuddle with people. Noxie is also very cheeky and is usually the culprit of all the broken things at home, but will position herself and Lumos so that it looks like Lumos was a the culprit! While we are out and about, Noxie much prefers the quieter places like farms, orchards, beaches and parks. She will tolerate being in busier areas but will get excited as soon as we are in a quiet place, or anywhere with birds! She also loves riding on shoulders and has stopped many people in their tracks by riding on our shoulders and head while we are out and about. Despite being so different, Lumos & Noxie are very attached. Yes, Noxie may hide from Lumos to get some space, but if they are separated, even for 20 minutes, they will spend hours snuggling and checking in on each other. They will also meow from different areas in our apartment to find each other. How did you get started going places with your cats? We started taking our family cat to places nearly 20 years ago. Tabby lived for 23 amazing years and travelled all around regional New South Wales (our state in Australia). Tabby was very attached to us, and we realised very early on that she did not enjoy staying in boarding. 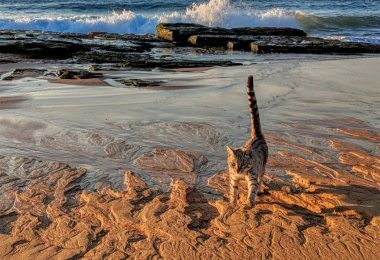 My dad did a lot of work in regional areas and we accompanied him – so it was only natural that Tabby did too. Tabby probably saw more of Australia than most Sydneysiders – definitely more than my husband who was born in Sydney! This was years before the adventure cat movement started. Initially we didn’t even have a proper carrier for her. It also was a while before we harness trained her. We only did this as we saw a dog in a harness and realised this was a safer way to take her out. We adopted Lumos & Noxie a few months after Tabby passed away and I knew that I wanted to try and harness train them so that they could travel with us like Tabby did. Funnily enough, it also cheaper to pay for the “pet surcharge” on our accommodation than pay for a stay at a cattery. The first instance we went away was a getaway to a farm, where they went for a walk and met ducks, horses and even wallabies. It was only after we came home that we thought we would try taking them out with us closer to home. To get them used to the ‘urban’ sounds and sights we started walking them in a laneway near our home and slowly moving towards places that are busier. Where do you go with your cat? 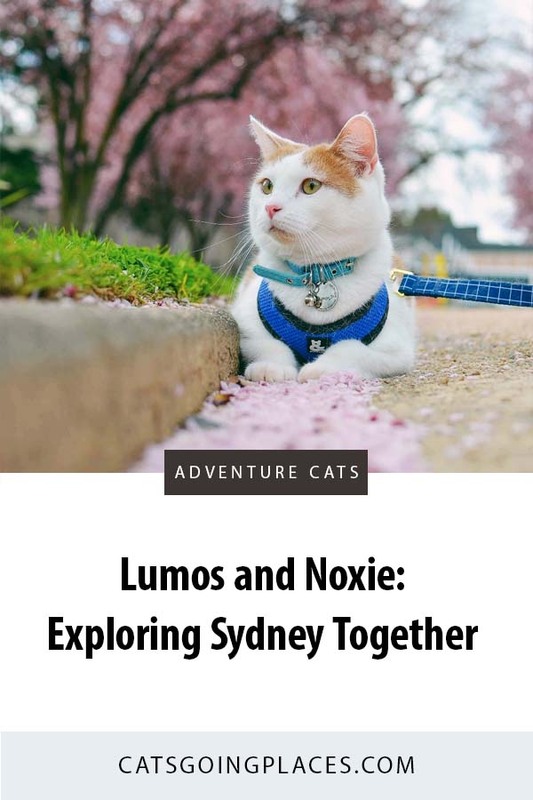 Now that we have begun to realise that Lumos & Noxie can go anywhere with us, we try and find as many places in Sydney that we can take them on the weekend. The best places to visit are the ones where the owners love animals. We really appreciate it when they come have a chat and then help share about cats exploring with others. While I do enjoy the occasional hike, my husband does not. We both love trying new food – so we try and find ways where we can do this and take the kitties with us. We love taking them to markets. It is a great opportunity for us to support local businesses and give them a day out. It is also a lovely opportunity to spread the word that it is possible to explore with your cat. As always Lumos loves being the centre of attention in the market and we always find a quiet spot so Noxie can walk around. We also love taking them to cafes. We always check the cafe’s social media to check that they are pet friendly and have outdoor seating. We’re lucky in Australia that it doesn’t snow, so we can sit outside all year. 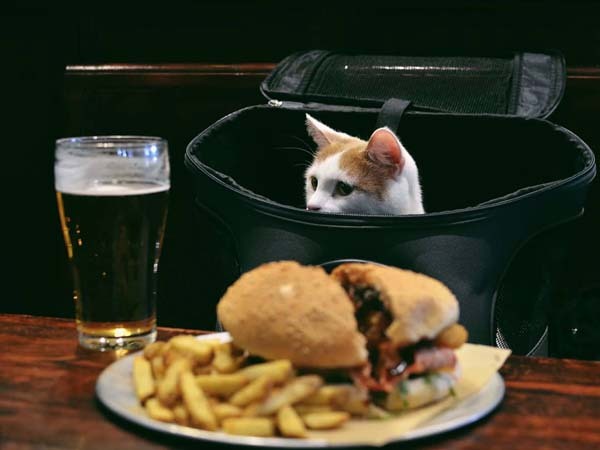 We have also recently started finding pet friendly pubs and even breweries. We have learnt that it is better to go for lunch rather than dinner, as the music may be a tad loud at dinner time. We also love going to parks and beaches. We look for quieter ones, where cats are allowed and there aren’t many off leash dogs. We have also visited pet stores. However, Lumos and Noxie got scared of the sound of birds so we haven’t gone back. 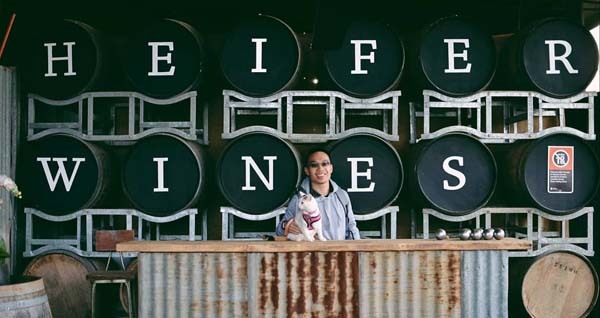 When we can, we get out of Sydney and take the kitties to farms, orchards & wineries. Noxie loves these trips so we try and book as many in as possible. In August we went for a 30 minute walk everyday to raise money for Guide Dogs Australia. It was challenging to find the time, but by doing that we were able to improve our kitties confidence. We mainly went for walks around our block as it was the easiest way to make time. It was exciting to see their confidence grow and awesome to show that cats can make a contribution to our community too.  Do you and your cats have a favorite destination? Noxie loves visiting farms and orchards. She loves the chance to run and smell all the animals and plants. She also enjoys visiting parks at dusk and will run around with her tail wagging happily. Lumos loves going anywhere really, as long as he gets a cuddle, some treats and feels comfortable jumping out of his backpack and smelling something new. How to people you meet while out with your cat respond? Most people approach us, ask us about the backpacks and Lumos and Noxie’s training. I always do my best to take the time to share the training involved and how there is a growing community. 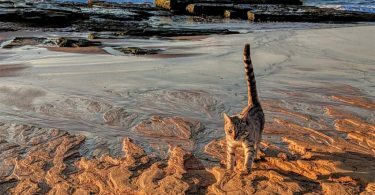 I share about the amazing things cats can do, like hiking, going on stand up paddle boards, being therapy cats and so much more. Most people are amazed and it is so lovely to see them walk away with a smile on their face. So many people have said that Lumos and Noxie have made their day and this honestly makes our day too. My favourite experience was the day we went to a brewery and pub in Sydney with a group of friends. We had been a tad nervous as this was the first time we took Lumos and Noxie to a social event. Everyone at the brewery was so interested in the kitties and we got asked so many questions. On the way back to the car, Noxie was riding on my shoulder as usual. We walked past a restaurant with seating on the sidewalk and facing the road. It was hilarious because everyone stopped talking and stared as we walked past. My hubby even saw a few forks halted midair between mouths and plates! We also have a lot of people take sneaky photos. Usually we know this is happening and if they seem friendly we will turn around engage in a chat and try to get the kitties to look at their camera for them. I know that a few people have been verbally attacked for walking their cats and this makes me really sad. We have had a few instances where we have been approached and I can tell that the conversation may go that way. However, I try and stay bubbly and positive and share as much as I can about how much Lumos and Noxie love it, the training involved, the amazing things cats in the community do and how we all keep our cats safe while out and about. Luckily by taking this approach, most people leave our interaction with a positive perspective. I’m not sure if this will work in every interaction, but it has worked for us so far. 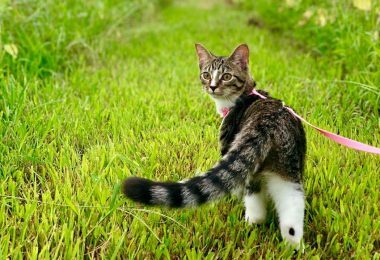 What have you learned by getting out with your cat? This sounds dramatic but – going on adventures with Lumos and Noxie has altered the course of mine and to a lesser extent my husband’s lives. Taking them out and about has helped strengthen our bonds with Lumos and Noxie. We have had to learn how to read them well, to see if they are comfortable, anxious, angry or happy. We’ve learnt more about their likes and dislikes. We’ve learnt to read their meows better. And after coming home after each adventure, they will come and give us an extra snuggle to say thank you for taking us out. My husband and I have learnt how to act as a better team. Lumos and Noxie are quite a team and have been known to gang up on us to get what they want – which may not be safe (like going into an unknown garden). We have learnt to trust each other more. I usually explore with Noxie while my husband explores with Lumos. We know that the other is looking after the cat they are exploring with. We have also learnt how to decipher whether a location is cat friendly and suitable for Lumos and Noxie. I have learnt how to read hotel and Air BnB listings to pick accommodation that is pet friendly. I have learnt how to find cafes and pubs that would let us in. My husband and I are also introverts, and I probably fall on the “extreme introvert” bucket. So speaking to strangers about Lumos and Noxie while we are out and about has really encouraged us to work on our social skills and taken us out of our comfort zones, in a way that we never would have in the past. Lumos needs an adventure once a week, so this encourages us to step outside our comfort zone. After all, they say that the most amazing things happen outside our comfort zones! But most of all, I have learnt about the amazing community of kitties who explore around the world. 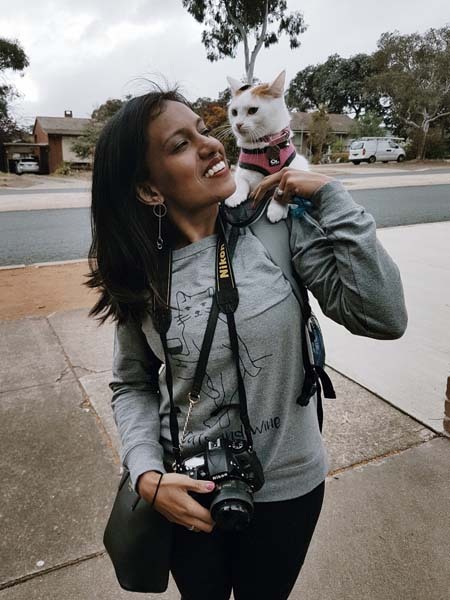 This community is so incredible, willing to share, to support, teach and celebrate each other that I created Catxplorer – a place to share our experiences, ask the questions we’ve always wondered, celebrate our successes and so much more. Adventuring with Lumos and Noxie has led me to create this community, which is now evolving to include many more exciting things in the new year. It has been so exciting to see Catxplorer help new explorers and older ones too. 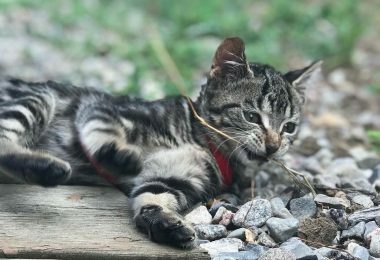 We’ve had owners use the information shared to take their kitties on their first camping trip. Other kitties who have been exploring for a while have finally found a way to go out in the snow. It really has been so special to celebrate all these achievements. You can follow Lumos and Noxie’s adventures on Instagram @theadventuresoflumosandnox and on Facebook at The Adventures of Lumos and Nox. They are also on the Catxplorer community’s web site, Instagram (@catxplorer) and Facebook (Catxplorer). Lumos & Noxie really have so much fun! Lumos and Noxie are having some awesome adventures! And love how they are enhancing their humans’ lives and relationship. Aww thank you Summer! They really have played such a huge role in getting us out of our comfort zones!